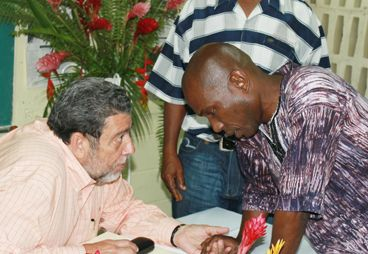 In a letter dated April 26, addressed to Rene Baptiste, chairman of the National Heroes Committee, Thomas indicated that his decision to resign “was precipitated by Prime Minister Ralph Gonsalvesâ Heroes presentation at the UWI Centre on Thursday 18, April 2013. “I am convinced that the Prime Ministerâs presentation has made our work superfluous. His talk was a good one and added much to the debate, but it has irreparably coloured and influenced the debate, particularly since PM Gonsalves is the head of Cabinet which makes the final decision as to who our next hero or heroes will be,â Thomas wrote in the letter. Thomas continued that he kept silent for the simplest of reasons â that being that he was a member of the National Heroes Committee and he thought that it would have been inappropriate to publicly support or oppose any nominee. “How then could it be right for Prime Minister Gonsalves, as the final arbiter of the selection process to weigh in on the debate with what was essentially a determined lobby for Robert Milton Cato? “For the foregoing reasons I find no useful purpose in me remaining on the National Heroes Committee,â Thomas wrote in the letter to Baptiste. During a press briefing on Monday, Prime Minister Dr Ralph Gonsalves says that he has no problem with the decision by Thomas to resign from the National Heroes Committee. According to Gonsalves, if Thomas believes that he (Gonsalves) may have said something that he disagrees with, then so be it, but he did not agree with Thomas that he (Gonsalves) had said anything wrong. He said that he has asked Thomas to be the chairman of the national reparations committee to which the Prime Minister said he had accepted. “So we can work on things which we agree, and if he feels strong about something he doesnât want to, thatâs fine with me,â the Prime Minister said. He continued saying that that was the nature of an open, democratic society. “Which is what I have always advocated â I have no problems with these things,â Gonsalves said. The National Heroes Committee held its first meeting on October 31, 2012. Besides chairman Baptiste, the other members are Curtis King, Aubrey Burgin, John Horne, Hans King, Monty Maule and Edgar Adams. After their deliberations, the advisory committee will submit a report to Cabinet, giving their recommendations. After deliberation on the recommendations made by the committee, the Prime Minister, who is Chairman of the Cabinet, will advise the Governor General to make the appropriate declaration.